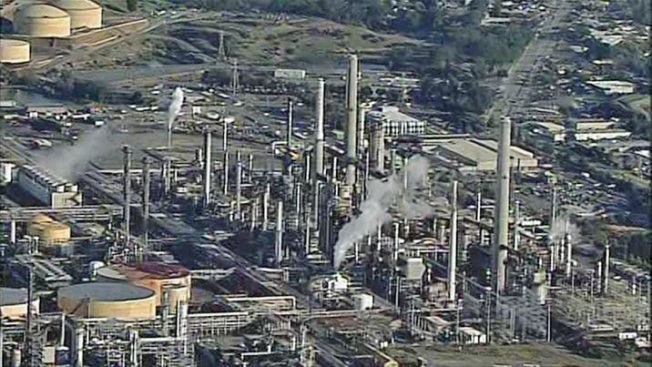 A public health advisory was issued Monday afternoon in Contra Costa County after excessive flaring and black smoke was seen at the Shell Refinery in Martinez. The incident comes after the refinery at 3485 Pacheco Boulevard experienced a partial power outage at 1:30 p.m., officials said. Power was restored at 2 p.m.
Odors from the excessive flaring and smoke were also reported off site, prompting a health advisory at 2:30 p.m. for Martinez and neighboring Pacheco. Officials advised people with preexisting respiratory conditions to take precaution and avoid the area. "Most people will not be affected. Eye, skin, nose or throat irritation may be possible for some people in the affected area," the advisory said. "If people experience any irritation, advise them to go inside and rinse any irritated area of their body with water." The alert was lifted just before 5 p.m.
For more information, go to the Contra Costa County health website.